Victorian England. The masses delude themselves into believing that they live in a world of science and rationality. A few know better. They know that there is a world beneath the world, a place of ghosts and monsters and mad occultists and strange spirits. These few — among them Simon Feximal and Robert Caldwell — struggle to defend the innocent (living and dead) against those who would exploit them, abuse them, and utterly destroy them …. 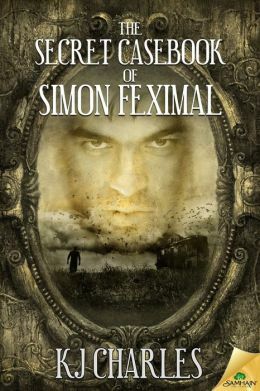 I was first introduced to Feximal and Caldwell in Remnant, a free e-novella which Charles co-wrote with Jordan L Hawk. I loved it, even though it alluded to characters and events with which I was unfamiliar. When I learned that Charles was releasing a novel centered around Feximal and Caldwell, I immediately pre-ordered it and than impatiently waited for the release date. First caveat: the book is not what I expected. Second caveat: I totally loved it anyway. The Secret Casebook is less a novel then it is a series of interlinked short stories. Caldwell narrates their adventures, Watson-like, over the course of some twenty-odd years. From their first meeting when Caldwell asks Feximal to rid his ancestral home of a lustful spirit, to their reluctant partnership involving deadly butterflies, through their realization that they were deeply in love and could not be parted (despite the danger of being outed), to their encounter with London’s subterranean Rat Queen, to Caldwell taking on a tremendous and painful burden to save Feximal’s life, to their final (official) mission in the trenches of the first World War. Each story builds on the previous tale, an element here and there carrying through, weaving an epic of love, passion, loyalty, betrayal, heartache, and danger. I love these characters. Brusque, wounded Feximal. Loyal, curious Caldwell. Theodosia Kay, Feximal’s adoptive sister, whose gift for divination is a painful, but useful, curse. Jo, the transgender seer, and hir ragamuffin tag-a-long, Sam. The mysterious Mrs. Phan, the only female member of the occultists club. And many others. I admit it: I was tearing up by the end. Even better better: since this collection covers more than twenty years in only a couple hundred pages, it leaves plenty of room for Charles to write more stories about Feximal and Caldwell in the future. She alludes to some of those adventures here; tantalizing hints (lavender-scented ghosts??) which have me wanting more. So go download The Secret Casebook right now. Read it. Then sit back and wait just as impatiently as me for the next story.